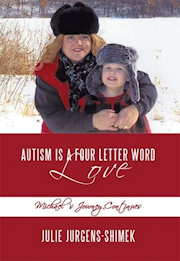 I am asked at every interview, every book signing, each speaking engagement my thoughts on what causes autism. I am very careful when answering this question. People are looking for an answer that is theory not fact at this time where autism is concerned. People are desperate for something to grasp on to for guidance, this statement applies to people who are connected to autism and people wishing to start a family and have fears. It is a slippery slope when you are given a platform to inform people. Great responsibility comes with this, I take it very serious. I have read so many findings and facts, spoke to Dr.'s, Scientist, the medical community. You name it, I have focused on it to gain information and knowledge. Here is my classic "go to" when this question on the cause of autism is presented to me. Take it for what it is. It is "our" story "watching autism" happen to our son. I was 32 years old when Michael was born. He was born 3.5 weeks early. He was healthy and weighed in at 6.9 pounds Oddly, my first son, Ryan who was 12 when Michael was born arrived 3 weeks past his due date weighing in at 8.9 pounds. Both pregnancy's that I have had were uneventful. Both boys delivered via c-section. Michael was a fussy baby, a bit of colic the Dr. said. Michael received all of his scheduled immunizations. Ryan also did. Michael like Ryan would receive his scheduled immunization and run a low grade temp, have the "hot bump" at the inoculation site, be a bit fussy for about 24 hours. I would give them each baby Tylenol per instructions from the Dr. This is the scheduled immunization list for each of my son's at "around" the same time. The "age given" scheduled had changed some during the time between each of the boys birth. The vaccinations and the number given had also drastically changed in that 12 years. At 6 months Ryan received a DTP vaccination- his next vaccination was at 15 months of age- a DTP and a MMR. I remember Michael's 12 month immunizations like it was yesterday. He was wearing a navy blue jogging suit, he was healthy and happy, it was like any other Dr. visit. He had his scheduled vaccinations, and a check up, height and weight was taken and the usual Dr. look over. All was well, until about 2 hours later. Michael began to run a high fever, not the usual low grade temp as he had in the past. I got Tylenol in him, however the fever continued to climb. He would not eat not drink. He screamed for several hours. I called the Dr. and spoke to the nurse who said to just keep giving Tylenol, just keep him in his a diaper with no other clothes and hold him as little as possible as my body heat would transfer and make him even warmer. After several hours, the Tylenol kicked in and Michael slept. The next morning, he was lethargic, and ran a low grade temp with Tylenol. I called the Dr's. office to update them as they requested the last conversation we had the day before. They seemed pleased that the high fever had ended and we were just dealing with a low grade temp at this point. They seemed unconcerned that I was mentioning Michael was still somewhat lethargic. His nurse said that all of the crying, the fever were the cause of this. Later in the day, Michael was hungry. I placed him in his high chair, gave him his juice in his sippy cup as this was how he took fluids for sometime. He stared at the sippy cup and had no coordination on how to pick it up and use it. He did not babble and coo, as he always did. He looked at the cereal I had placed on his high chair tray and could not pick it up. It was as if he did not know what to do with it. He just sat in the chair, staring out into space. Something was wrong. He would not talk. He would not say "mama" "dadda" "bye, bye" --he would not say anything. It was as if his voice stopped working. I could see the change right before my eyes. I called the Dr.'s office and said I was bringing him in and wanted the Dr. to see him ASAP. We went to clinic, the Dr. checked him over and said he was fine, he was behaving no different that many babies after a fever and a "long night" of upset and crying. He said he was just tired and I should help him eat and drink and put him down for a nap. I felt like I was politely being told to settle down, quit being so over protective. I left the Dr.'s office feeling foolish and bad for wasting their time and messing up the other patients appointment time. My husband, our now 13 year old son ( his age at that time ) and myself watched Michael leave us, over a 12-24 hour period. Michael has never been the same. I did not hear him say "mama" for almost 4 years after that day. After years of intense work, he was able to say it again. Not everyone can understand what he is saying when his calls for his "mama" but his "mama" knows. **Also noted, Mike contracted the RSV virus ( most kids do ) and was in the hospital for about 24 hours for dehydration. Unbeknown to us, he was given a flu shot, with Thimerosal. I discovered this while researching his medical records several years ago. This shot was given after this 12 months shots. Mike was 17 months old at this time. We were told after this discovery that ALL patients were given the flu shot as the strain at that time was significant and it was the hospital policy for all patients and staff to have one. This was their reason for not consulting us, not getting approval from us when it was administered. We were not present in the room when it was given. We had NO knowledge of this shot, only after I discovered it in his medical records. ***After much research and discussion with Dr.'s Michael has had no further immunizations after the 12 month schedule but the flu shot we were unaware was given at 17 months of age. We weighed the pros and cons heavily. It was not easy for us to make this decision. We did however believe that the risk was one we would have to take. Mike had so little of himself left, IF it was in fact an issue with the vaccications, we would lose what little was left of him. We fully understand the risks. It is not easy to except that your child could become seriously ill or die from this decision. We think of that everyday. I have more to add to this post but other duties call. Michael is home on spring break from school. He will be 11 years old in June. He and I have plans for the day. We are going to draw, color, maybe go outside if the suns shines for us today. Michael needs 24/7 supervision, he will never live independently, he is what I call "classic autistic", he relies on his "mama" for each step the day brings him. Michael will always be autistic. He has worked so hard to gain the skills he has. Fantastic people have contributed to his growth. For that we are thankful. I always tell people that for each milestone that he achieves, he works 1,000 times harder then the average child to meet it. Some he will reach with hard work, and many he will never be able to meet due to his autism. The CDC has just announced their current data on autism numbers in America. 1 in 88 children are now diagnosed with autism. There are no concrete answers on the cause of autism at this time.